Price: £10 on the door or in advance (£8 Members). 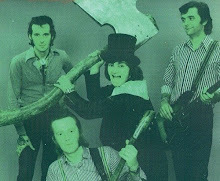 Famous for being the backing band of Screaming Lord Sutch, The Savages have continued to perform in their own right after Sutch’s death in 1999. 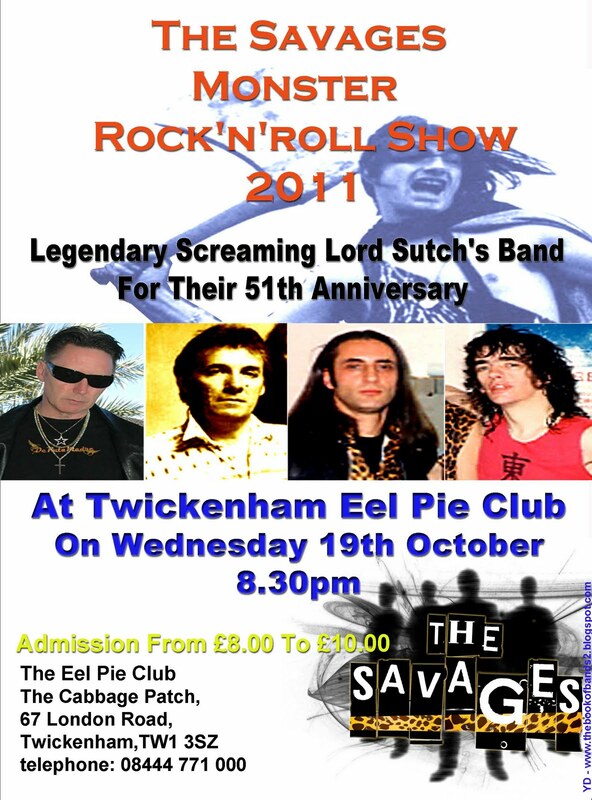 2 original Screaming Lord Sutch members remain - Nick Simper of Deep Purple fame on bass and Texan keyboard player, Johnny Casanova (who played Jerry Lee Lewis in the West End musical). They are joined by Angi Antinori on lead guitar and Jack Irving on drums and vocals. 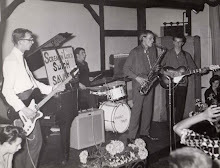 The quality of musicians is as excellent today as it was in the days of Sutch. 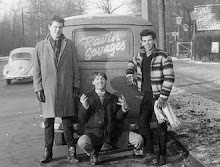 The Savages are 'the spiritual home of rock and roll' whose heritage is second to none in its history. A special one-night performance with a rock band and projected archive photographs to celebrate 50 years of the first ‘School of Rock & Roll’. The two plays have been combined as one with a narrator. 4th November, 2011. Abbey Theatre, Nuneaton. Years 1946 - 1963. Life with Reg was never going to be easy. Falling in love with an entrepreneur and a man of dreams was like living on a roller coaster. 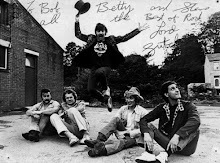 This is a funny and poignant story about the extraordinary and zany lives of Reg and Dorothy Calvert, from living in an old bus and selling sweets to managing pop groups and owning the first School of Rock & Roll. 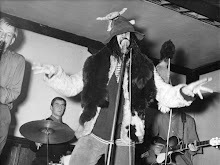 ACT TWO: DEATH OF A PIRATE (The story behind Pirate Radio) Years 1963 to 1967. Success is just a dream away. They have a beautiful house, manage successful pop groups with recording contracts, some with top ten hits, including The Fortunes, Rocking Berries and Pinkertons Colours. 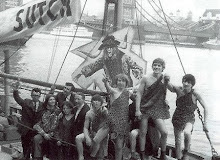 Campaign for Votes for teenagers with Screaming Lord Sutch. Life between Reg and Dorothy becomes turbulent as Reg pursuits what seems an impossible dream. To own his own pirate radio station. This play follows the rise and fall of pirate radio in the 1960’s and is a heartbreaking story of love, anguish, conspiracy and murder. The two plays have been specially edited and adapted to combine as one complete story. 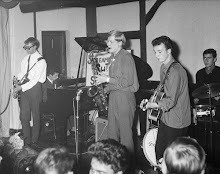 (4 new songs plus extracts from 1950’s - 60’s songs). Dave Pullen sells a painting of a train, painted by David Sutch, he bought 12 years ago at an auction in Brighton. Its size: 10 in by 7 inch. It is in good condition, and he's open to an offer. The painting can be seen on this online album that will be available on SkyDrive until 19/12/2011. 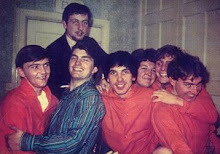 George McFall 19th March 1949 - 7th October 2010. May he Rest in Peace. All funds raised, going to George's wife Sheila, and the cancer charity of her choice. 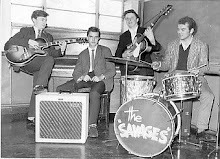 "Crippling Injury forces Savages to Reschedule Gorleston Gig"
'The Savages are having to reschedule their upcoming gig at The Gorleston Pavilion on Halloween night due to a potentially career threatening injury to keyboard player and vocalist JohnnyC. The Savages have recently been at Purple Studios in Norwich working on their 50th Anniversary recording project, as well as fitting in rehearsals in London for their Monster Halloween Rock and Roll Show, which was due to take place at The Pavilion, Halloween night, but this heavy workload has taken its toll on the cult keyboard player who is renowned for his pump-action keyboard style. Johnny had been complaining of pains and feelings of numbness in his fingers as the hours of playing every day in either the studio or rehearsal rooms continued relentlessly. 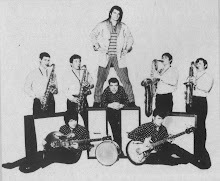 "When back in London I thought I had better get the problem looked at ", said Johnny, "and I was told that I had a bad case of Carpal Tunnel Syndrome (CTS), and that I needed to completely rest my right hand in particular for two weeks before treatment could begin. When I told the specialist that I had an important gig coming up within a couple of weeks, I was stunned when he told me that if I persisted with my current workload, then I could suffer permanent damage to my hands. It was game over ". The band have had to put a hold on all further studio work until Johnny can address the problem and hopefully get himself back to his 'blistering best'. CTS is not uncommon amongst keyboard players, and following diagnosis, is both treatable and manageable. The Savages will be announcing a new date for the Show at The Gorleston Pavilion following consultations with the theatre management. 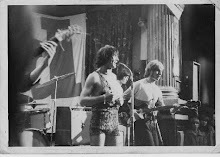 A spokesperson for The Savages said, " It is regrettable that we have had to reschedule the Show as the band were looking forward to performing at The Pavilion, which has such a great feel to it, but looking after the welfare of the band members is, of course, a priority. 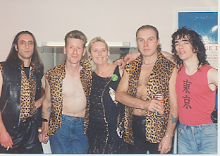 The Savages will be performing at The Gorleston Pavilion in the New Year. You can be sure of that ". 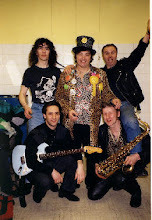 • “SCREAMING LORD SUTCH STORY” is now available on CD!